Peter H. Dernoeden, Ph. D.
Throughout July we experienced timely rain on a weekly basis in most areas. During the first two weeks of August, we experienced numerous heavy rains (≥ 1.0”; some cells delivering > 4.0’ in some areas) and extended overcast periods. These conditions are ideal for both diseases and weeds. Heavy rain events cause havoc with mowing operations and also stimulate incredible amounts of weed seed to germinate. 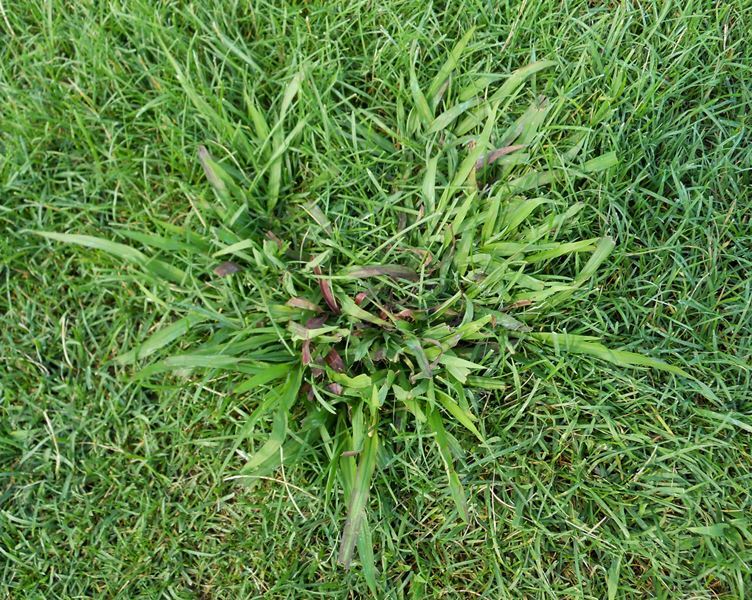 Crabgrass and goosegrass typically break-through in late summer, since spring-applied preemergence herbicides have broken-down and no longer provide protection. There are a multitude of weed species that seem to “blow out of the ground” in late summer following rain. 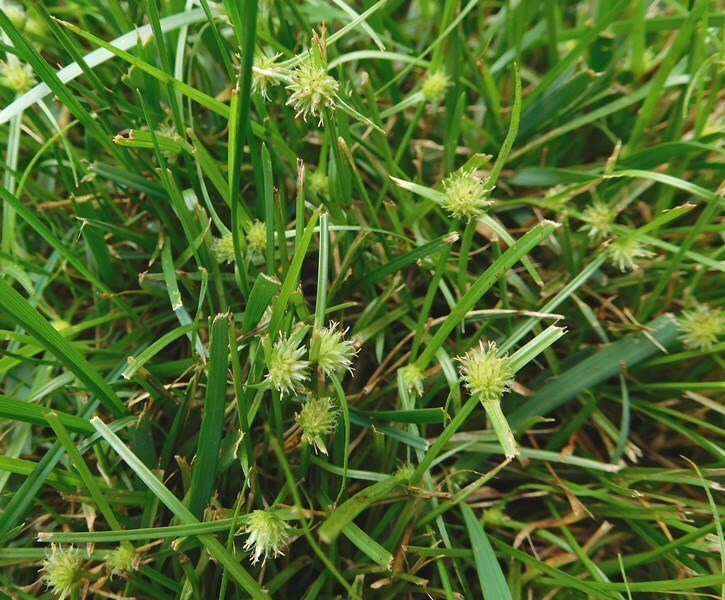 Among the most difficult to control include sedges (i.e., yellow nutsedge and Kyllinga), spurges and Dallisgrass. Given warm and wet soils, weeds grow rapidly and become both obnoxious and invasive. Sedges are perennial, turn brown in winter and do not become noticeable again until early summer. Yellow nutsedge (YNS) plants sprout from underground tubers and rhizomes or emerge from seed. Kyllinga does not produce tubers, but its rhizomes are fleshy, wiry, more numerous and longer, and spread rapidly. Seed dispersal is a major mode of distribution of sedges. As sedge plants mature, they develop shiny, yellow and three-ranked, triangular- shaped leaves. YNS plants are easily hand-pulled. Conversely, mature mats of Kyllinga require a shovel to remove. YNS seedheads do not develop in routinely mowed turf, but Kyllinga seedheads are produced in mown lawns, roughs and green surrounds. 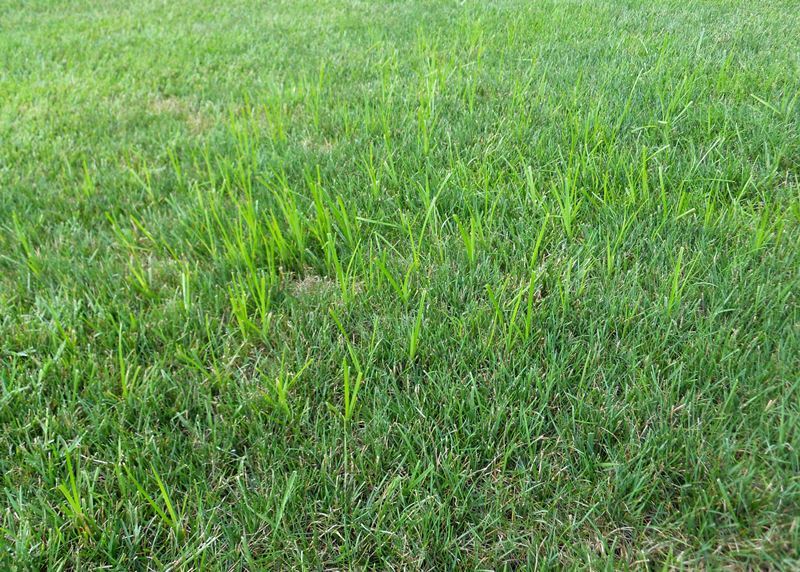 YNS can extend 2-3” high in lawns and roughs in just a few days after mowing. Conversely, Kyllinga does not grow as rapidly and blends in better. Indeed, many turf mangers don’t recognize a Kyllinga problem until late August, when seedheads become abundant. Kyllinga seedheads are yellow-green (eventually turn brown) in which flowers develop in globe-like clusters. that grow above turf canopies within a few days of mowing. In late summer, dense Kyllinga patches become bright yellow. are produced in abundance in late summer. Kyllinga rhizomes are long, thick and wiry making it very difficult to control. Currently, there are no effective preemergence herbicides that target sedges. Postemergence herbicides (e.g., Celero, Dismiss and Prosedge/Sedgehammer) control YNS, but the problem is that they emerge all summer and so multiple applications become necessary. Kyllinga is especially difficult to control given its extensive network of rhizomes and at least two applications, and often more, are required. Professional’s either swear by or swear at the aforementioned herbicides, but Dismiss appears to be more effective on Kyllinga. Timing is very important in control of Kyllinga. 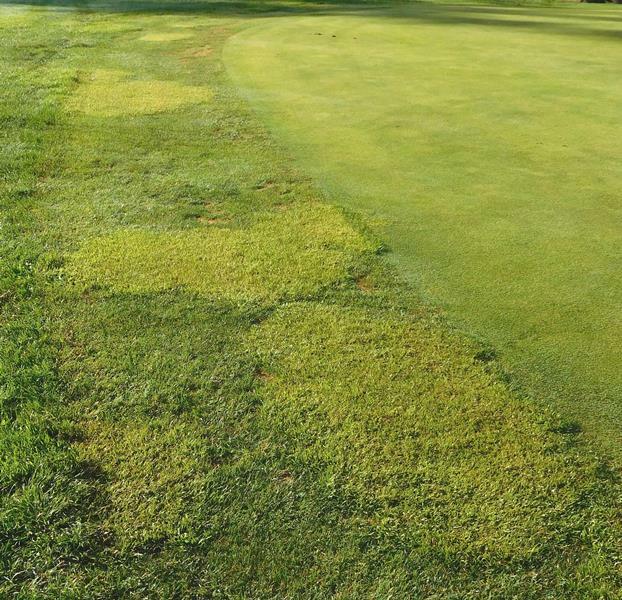 According to Steven McDonald’s research (Turfgrass Disease Solutions), Kyllinga is best controlled when the first application is made just after mats become apparent in late May. 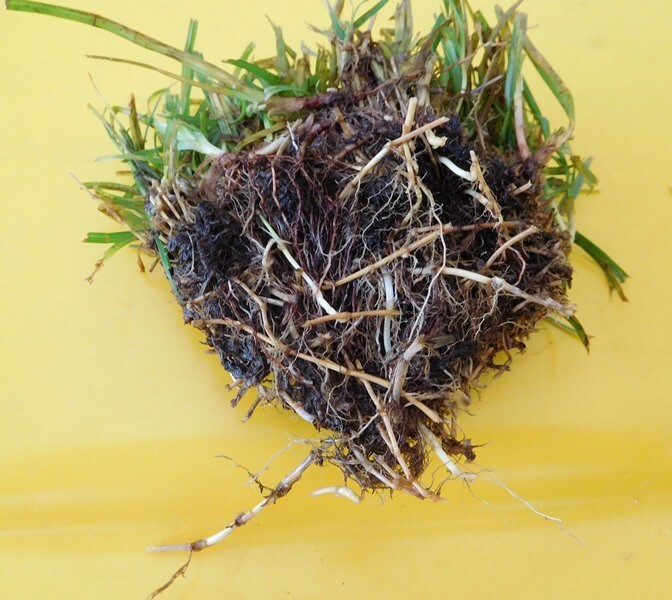 A second application is needed 21-25 days later, but some plants often survive via rhizomes. The bottom line is that Kyllinga is an incredible foe and removing plants physically when first observed is the best method of control. Spotted and prostrate spurges are annual broadleaf weeds, which are nearly identical in appearance. Spurge seedlings emerge as soils warm in early summer and plants continue to appear all summer. Young plants are inconspicuous until they begin to grow above the turf canopy. Leaves initially are egg-shaped, but as they mature they become elongated, and oblong to linear in shape. Individual leaves may or may not have a reddish or purple-colored spot near the center of leaves. Numerous stems radiate from the base and grow prostrate. When stems become numerous they form mats that can inundate turf. Plants produce a shallow taproot and stems ooze a white, milky substance when cut. Inconspicuous flowers aggregate in clusters in leaf axils and quickly produce seed. Spurges are extremely difficult to control in summer. Products containing clopyralid (e.g., Confront and Lontrel) work well, but often two applications are needed once stems radiate. 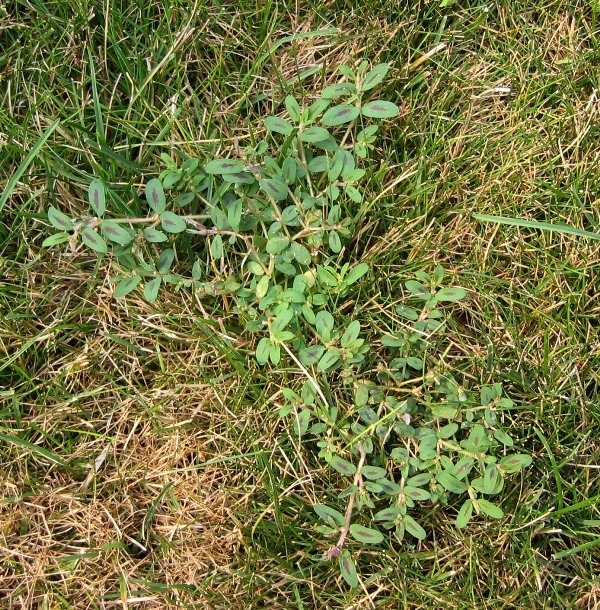 Clopyralid, however, may not be used on lawns. For LCO’s, nothing seems to work well, but antidotal observations suggest that Dismiss and Solitaire (Dismiss + Drive) have good activity. (sometimes with purplish spots) and are extremely difficut to control. There are three Paspalum spp. (Dallisgrass, and bull and field/smooth paspalum) in our regions, which are generically referred to as Dallisgrass. These grasses are warm-season perennials, and among the first to green-up in spring. Leave die in winter and plants disappear, but stems and seed survive. 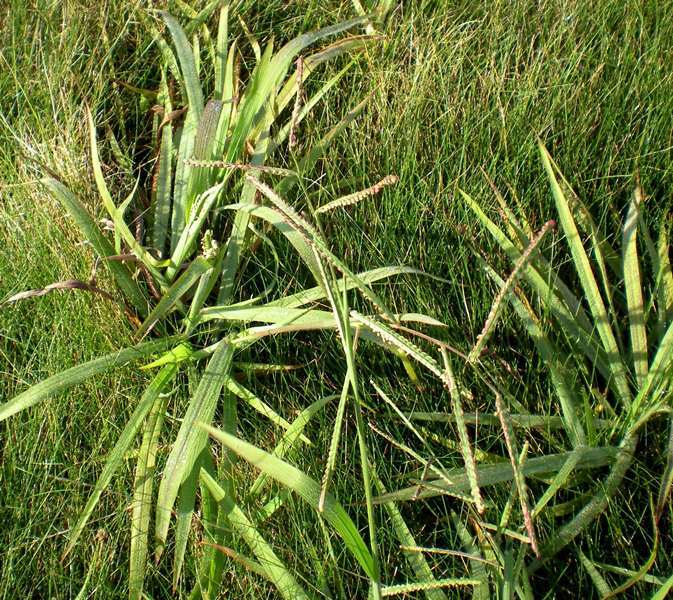 Dallisgrass has broad, coarse textured leaves and develops in thick clumps. Leaves are flat, and may be sparsely to densely hairy depending on species. A common biotype in our region produces some purple-colored leaves in the center of clumps. Seedheads form in late summer and seeds are born in rows on finger-like spikes and are noticeably shiny, whitish, flat, and oval-shaped (similar to goosegrass). Only MSMA is known to control Dallisgrass, but only is labeled for use on golf courses and sod farms. Multiple spot-applications of MSMA are required on 14-21 day intervals. This herbicide will yellow turf and cause severe damage if not properly applied. Pylex and Solitaire suppress Dallisgrass. For lawns, it is extremely important to dig-out clumps as they appear and before seedheads are produced. and some leaves may be purplish. and produces flat, round seeds on finger-like spikes.